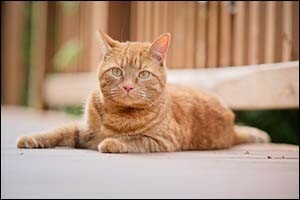 Cat Care in Dartmouth, MA: Should You Let Your Cat Outdoors? One of the biggest debates that cat owners have is whether or not they should allow their cat to go outdoors. If you live in an area that has a lot of predators, chances are that the decision has already been made for you. If you live in an area with a lot of busy streets and speeding traffic, once again the decision is probably quite simple. Unfortunately, there are a lot of people throughout the South Coast area that aren’t sure about what to do regarding a cat’s natural instinct to want to go outdoors. Fortunately, there is a lot of information and data available from the American Humane Society and your local Southeastern Massachusetts emergency vet that may help you. The first thing you should do when you get a new cat is to come by our local Dartmouth animal hospital for a veterinary check-up. Whether your cat is a kitten or a grown adult, getting started with a routine check-up, vaccinations, preventive treatments and feline dental care will ensure a long and healthy life. Beyond that, make sure to ask your veterinarian about any other questions you might have, such as deciding whether to let your cat outdoors or keep him as an indoor pet. While the general answer would be no, it is best to discuss your situation, lifestyle, area where you live, and possible reasons for letting your cat outdoors with a veterinary professional. Cats do have a natural instinct to want to get outdoors into the fresh air and sunlight. However, you don’t necessarily have to give in and open the door to give your cat these experiences. There are other methods that can be used to provide your cat with the freedoms he desires, without the risks that are associated with having an outdoor cat. When it comes to letting your cat outdoors there are a number of risks that should be considered. One issue is regarding feral cats. There are approximately 60 million feral and homeless cats living in the United States, many of which carry diseases that can be passed on to your cat even if your cat has gotten all of the regular vaccinations at a veterinary check-up. Some of these diseases have the potential to be fatal, or at least very serious with regard to your cat’s health. The knowledge that when cats come in contact with other cats there are very often physical disputes or fights, which is how many of these diseases get passed on, is even more of a concern than with other types of pets. Other health concerns with regard to having an outdoor cat include parasites, such as fleas, ticks, mites, worms and ringworm, some of which can be passed on to humans. Once your cat gets parasites, chances are good that they will transfer to other pets in the home, as well as to other members of your family. Parasites are very difficult to get rid of once they get indoors. Safety concerns should also be considered, such as neighborhood vehicles; animal cruelty from kids or adults in your neighborhood; wild animals; loose dogs that might harm your cat; poisons or toxins put out for pests that also attract cats; and serious or fatal injuries caused by a fall from a tree or fence, just to name a few. Cats can also be environmental pests if they go after birds, reptiles or other native species. According to national statistics, loose or outdoor cats are responsible for killing hundreds of millions of birds each year. If you still feel compelled to let your cat outdoors, even for short periods of time, make sure to work closely with your Southeastern Massachusetts emergency vet. Before allow your cat to go outdoors, even in a protected environment, make sure to bring your cat in for a veterinary check-up and feline dental care evaluation or treatment. Whether your cat goes outdoors or stays indoors for its entire life, make sure that you spay or neuter your cat. Bring your cat in again at least once each year for updates on vaccines, preventive treatments, parasite testing and any other care that might be needed. If your cat will be going just in your backyard, make sure that he is supervised by an adult at all times to prevent strays from coming in contact. Another option is to put your cat into a harness and leash, or bring your cat out in a secured cage or other type of cat outdoor tool that will allow your cat to enjoy the grass and fresh air without coming in contact with other animals. Make sure your cat can’t get out and other cats can’t get in. You should still consider supervising your cat’s outdoor time at all times using these methods. Bring your cat in for a regular veterinary check-up at Anchor Animal Hospital. We are a regular veterinary clinic that provides basic veterinary check-up and feline dental care services, but we are also a reputable Southeastern Massachusetts emergency vet, performing surgeries, treatments, and emergency services for injured animals in the South Coast region. Give us a call at 508-996-3731 to schedule an appointment or to learn more about the services that we provide.